This rice bowl is such a great versatile recipe. 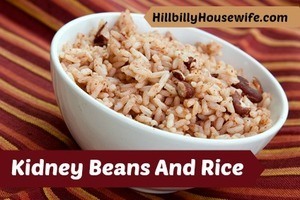 You can cook it in big batches and between the rice, the sausage and the kidney beans it really fills you up. If you’re cooking this for young kids, you may want to omit the hot sauce and cayenne pepper while you’re cooking. Adults can add it to their taste later. Feel free to play around with this recipe. If you don’t have kidney beans in the pantry, fix it with some rinsed black beans or even pintos instead You can use any small bits of leftover chicken, pork, sausage and the likes instead of the smoked sausage the recipe calls for. Get rice cooking according to package directions. While rice is cooking, put the remaining ingredients in a large saucepan over low heat. Stir together and simmer for about 25 minutes or until rice is done cooking. Put the cooked rice in the saucepan with the kidney bean sauce, stir, taste and season if needed. Continue to heat over low heat until nice and hot then spoon into large bowls and serve immediately.